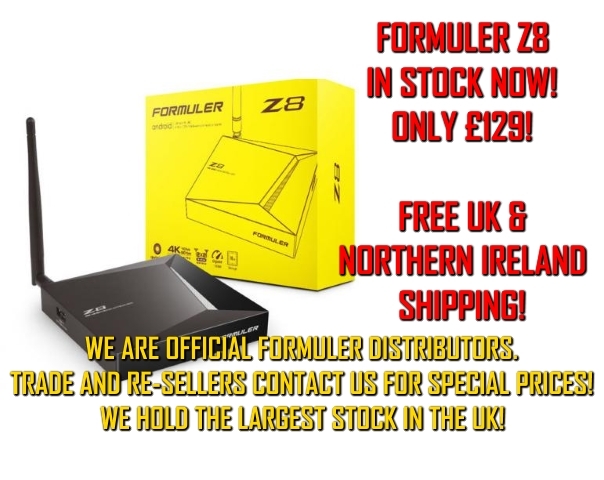 Thread: New Formuler Z8 in stock! £129 including FREE UK & Northern Ireland shipping! SUPPORT FOR UP TO 10x PORTALS. 2GB DDR4 RAM + 16GB eMMC. DUAL BAND WiFi 2.4 GHz / 5.0GHz. FREE UK & NORTHERN IRELAND SHIPPING! SEE THE COMPLETE FORMULER IPTV RANGE HERE. CALL US ON +44 (0)1992 451600 OR OPEN A PRE-SALES SUPPORT TICKET HERE. WE HAVE THE LARGEST FORMULER STOCK IN THE UK! TRADE ORDERS SUPPLIED FROM STOCK!